Mihai’s Ethereum Project Update. The First Year. Hello, fellow Ethereans. I am Mihai Alisie, one of the Ethereum founders, and for the past year I’ve served as the Vice President of the Ethereum Foundation and Director of Ethereum Switzerland. In the early days of the project I concentrated my attention on the community side and worked on the holons idea for a distributed physical infrastructure; however, the project needed someone in Switzerland, and I was more useful here focusing on other things. During the the last couple of weeks I started to think about how far we’ve come and how many things we have accomplished since this project started. From idea to implementation and everything in between, it was (and continues to be) the most intense ride of my life. While contemplating the things that have happened during the past year, I felt inspired to write this post. As I started to go through the posts, tweets and messages published over the last months, the article started to take the shape of a timeline that offers a window into the heart of this project. Looking back. What started as a vision. I vividly recall the autumn of 2013 when I first encountered Vitalik’s ethereum idea concentrated in the initial lines of what was going to become the Ethereum Whitepaper. He sent it to me in an email, mentioning that the message had been sent only to a select few. 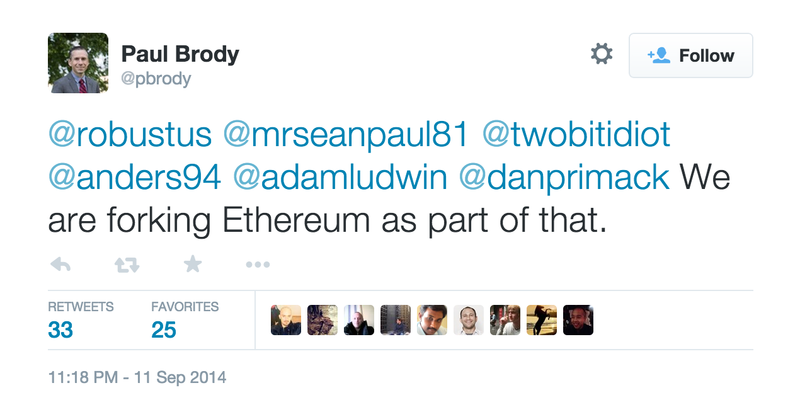 Ethereum felt different from anything else he’d sent me before. The same rush I felt when I first understood the implications of Bitcoin was returning, this time with thousands of new multi-dimensional rabbit holes to explore. 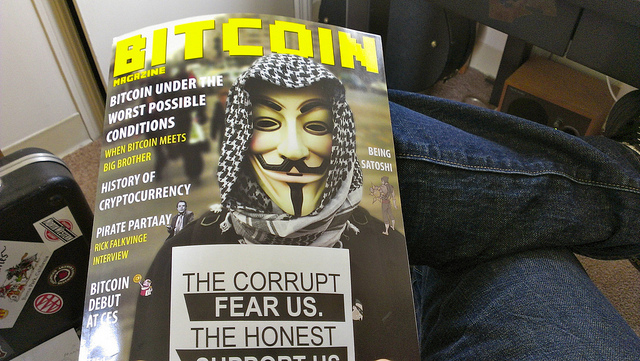 Myself and Vitalik go way back to 2011, when we first got in touch and started Bitcoin Magazine together. A few months after exchanging our first messages over the Internet, we published the first issue and had a team of passionate people making it happen with nothing more than Skype, Google Docs and little to no money. It definitely wasn’t easy, but it was fun. The mag pushed us into growing at an accelerated rate, each in his own way, opening in the process many opportunities for the both of us. Along the way I have gained a deep respect for Vitalik as I’ve watched him grow as a colleague, mind and person. This is why I felt both honored and incredibly excited when he invited me to be one of the founders of this project in late 2013. And then the rollercoaster left the station. 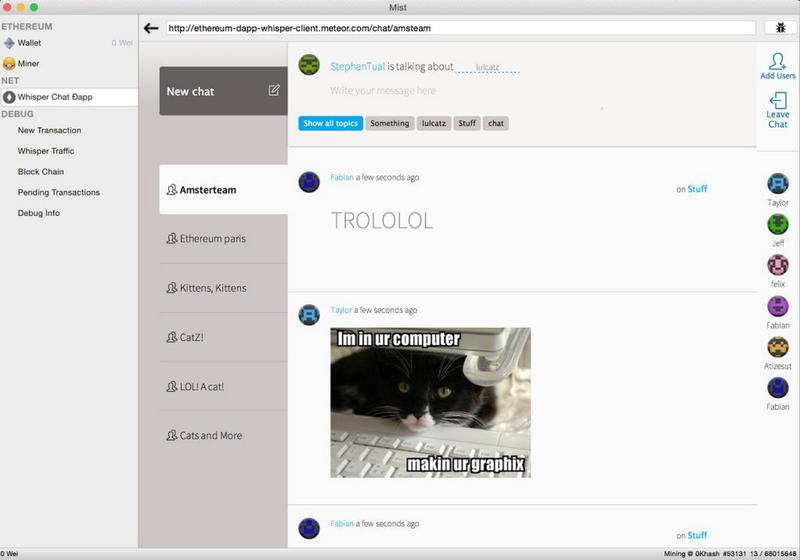 Between December 2013 and January 2014 the focus was mainly on how to bootstrap the vision set forth by Vitalik in the Ethereum Whitepaper. We all ended up agreeing that having a Genesis Sale was an exciting idea; however, it was also one of the most challenging at a strategic level. After long discussions on multiple levels, we decided to postpone the Genesis Sale from happening in February in order to create a proper infrastructure and legal strategy since we were navigating in deep, uncharted territories. With that in mind, we scouted a number of jurisdictions, hoping to find one that would work as a base for the project. It was certainly a discouraging effort at times, considering the lack of legal clarity associated with the space we operate in, but we kept pushing. This is how and why, at the end of January 2014, I was landing in Zurich with the mission of scouting Switzerland as a potential jurisdiction for what became in the meantime the Ethereum Project. 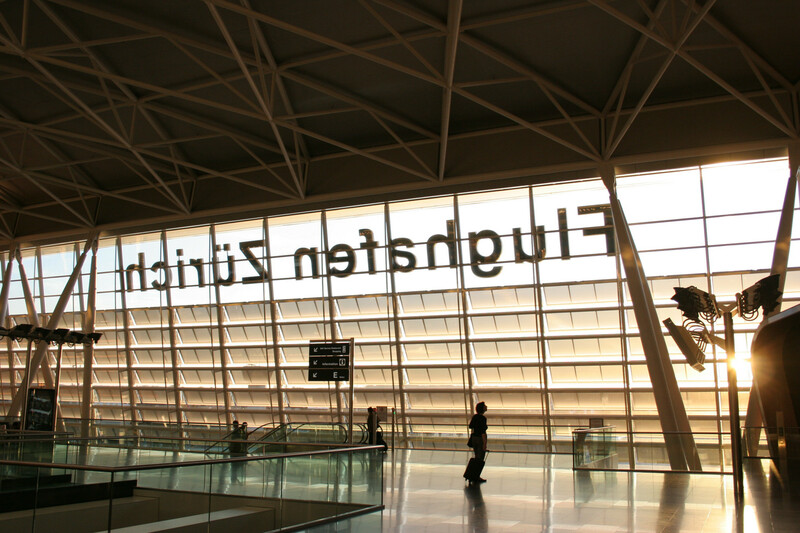 Switzerland looked interesting from the beginning thanks to its strategic positioning in the heart of Europe, being at the same time a financial nexus with a friendly business environment, the world’s center for Human Rights and a Global freedom of speech and innovative technology hub. 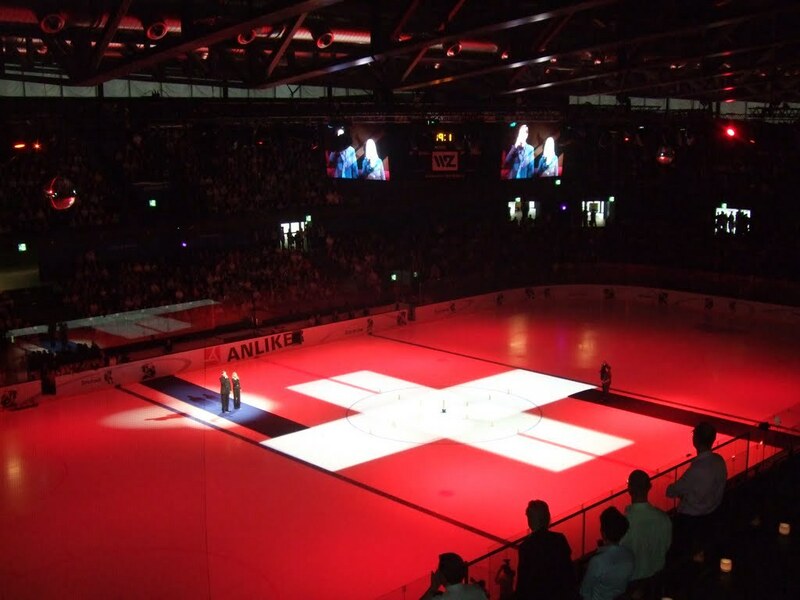 We were not the only ones to see these things as great, in 12 May Silent Circle joining us in the beautiful Switzerland for similar reasons. We couch-surfed for a while, moving six times in five weeks through various Airbnbs while keeping focused on the mission, and in a short time the trip to Switzerland turned to be an oasis of hope for Ethereum. Thanks to the friendly and warm Swiss crypto community we were not completely alone and we received invaluable local input with regards to what to do and where. In less than a month since we first touched down at the Zurich airport we had a Swiss entity up and running and a legal strategy starting to take shape. A big “big up” goes especially to the guys from Open Transactions and Bitcoin Suisse for their help and for the strategic Swiss networks they shared with us. February 2014 was a wild month, with progress being made on all fronts: community growth, codebase, wiki content, business infrastructure and legal strategy. During this month Vitalik revealed Ethereum for the first time at the Miami conference, we had our first reddit AMA, and the core development team solidified into a world-class crypto crew. After the Miami conference, Gavin Wood and Jeffrey Wilcke came on board full-time, although they were working on Ethereum out of pure passion months before this while building the official C++ and GO clients. Since our launch strategy had changed, instead of launching the Genesis Sale immediately we chose to release the open source alpha testnet client first. It turned out to be an excellent decision as it brought us increasing attention from the crypto community as a whole, since people were able to see and test that the thing actually works. March began in force with the Proof of Concept 3 client being released on the first. On March 5th, after a long search, we finally moved into our Ethereum Spaceship located in the beautiful Canton of Zug. 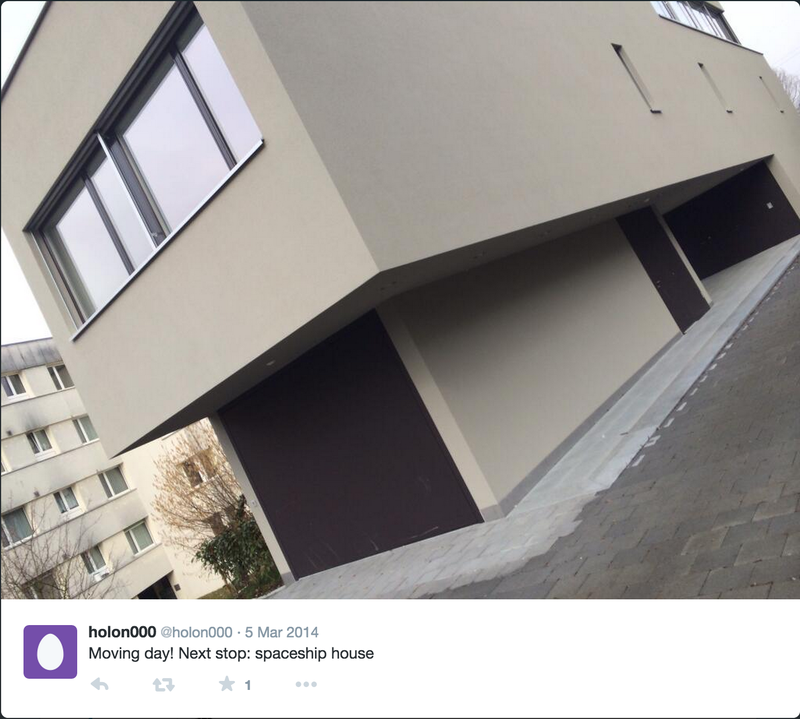 The “spaceship” marks the birth of holon 000, our Swiss Ethereum HQ. Between March and May, an area that received considerable attention was the regulatory side of the project. Even if it was frustrating at times, during these months we worked hard on crafting the legal strategy and the optimal organizational structure for the Ethereum Project while surfing the murky worldwide regulatory waters. After months of strategic legal grinding, on May 20th the Digital Finance Compliance Association was created with the purpose of interfacing with the Swiss authorities and providing guidance while also providing assistance and advice for current and new members. DFCA will most likely become more prominent in the coming months as it will enlarge its focus and interact with other worldwide jurisdictions. In the meantime, for those doing crypto projects in Switzerland or looking to relocate into a friendlier jurisdiction, you can get in touch with DFCA for help and/or more info. 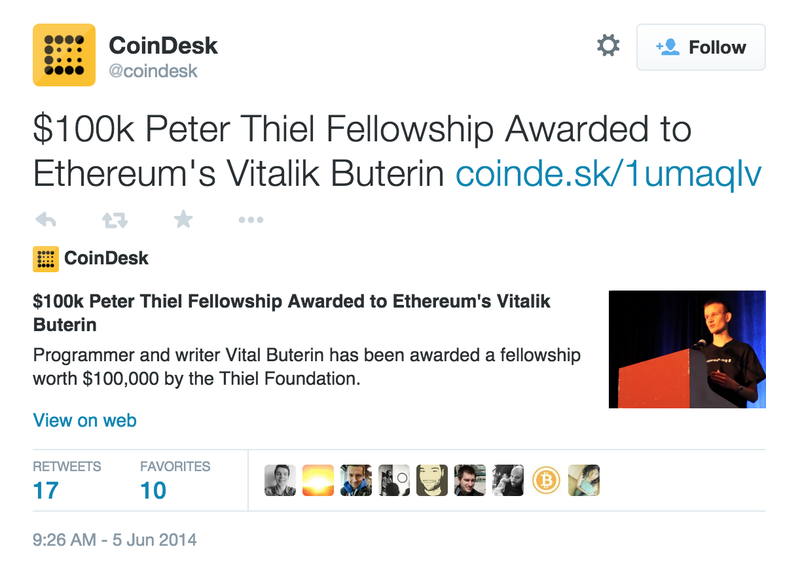 June brought a nice surprise in the form of the Thiel Fellowship being awarded to Vitalik for the cutting-edge work he has been doing with Ethereum and elsewhere. At the same time it felt like an official recognition of the efforts put into creating this new decentralized ecosystem. 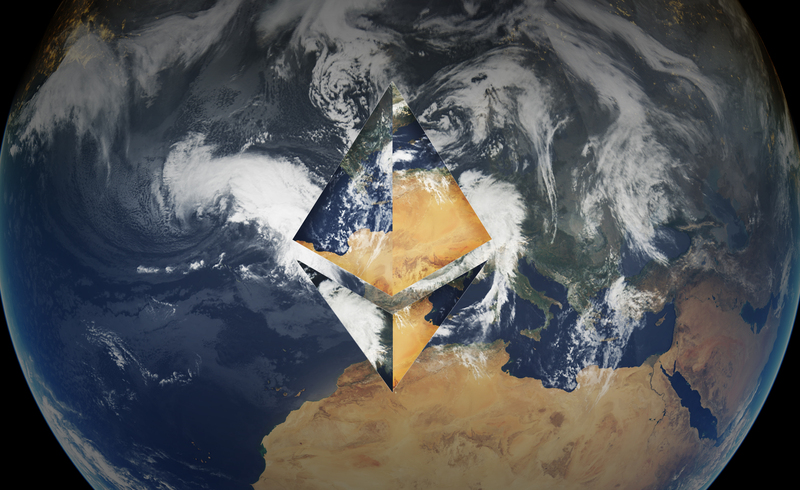 On the other Ethereum Project fronts, by June we advanced to the fourth version of the Proof of Concept implementations, rapidly moving towards the fifth version; our Twitter followers number surpassed 6,000; and the number of global meetups that focused on Ethereum reached 58 groups in 49 different cities, spread over 19 countries. Things started to get big. Internally, during this period we had intense soul-searching sessions while also engaging in conversations with the community regarding the nature of the project. All the discussions converged into one major decision: should we go for-profit or non-profit? The decision was to pursue the non-profit route in order to make sure that the vision does not get corrupted. We all saw what “not being evil” means for some people when profit is involved. The community applauded the decision. In July the idea of a 12 sec block-time was taking shape, we finally had our worldwide legal strategy set up, and the final Genesis Sale preparations were in full swing – with a strong focus on the design, creation and testing of the sale app and multi-sig system. In a true “victory comes to those who are prepared” fashion, Taylor and Marian managed to deliver a system able to support a flux of over 31’500 BTC flawlessly. July 14th marked the birth of the Swiss Ethereum Foundation, followed on the 22nd by the release of the Proof of Concept 5 and culminating in a bang on the 24th with the start of the Genesis Sale synchronized with a second reddit AMA. In the first part of August the sale price of ether started to increase from 2000 ETH/BTC to 19xx ETH/BTC towards the last rate of 1337 ETH/BTC while steady progress was being made on the technical front. Vitalik compared the state of Ethereum at that date with the state of Bitcoin in mid-2009. Some catch-up was in order. As the Genesis Sale was approaching its end, the focus of the project shifted towards building the Ethereum core and scaling up the operations. This is also why we took the decision to start ramping up development and global operations before the Genesis Sale ended. It turned out to be quite a challenge to establish the banking and financial infrastructure required for a project of this scale; however, after many searches and discussions with different entities, we found the solutions we needed. In the end, according to Swiss law, through the Genesis Sale we bootstrapped a peer-to-peer platform on which decentralized applications can be developed, deployed and utilized. 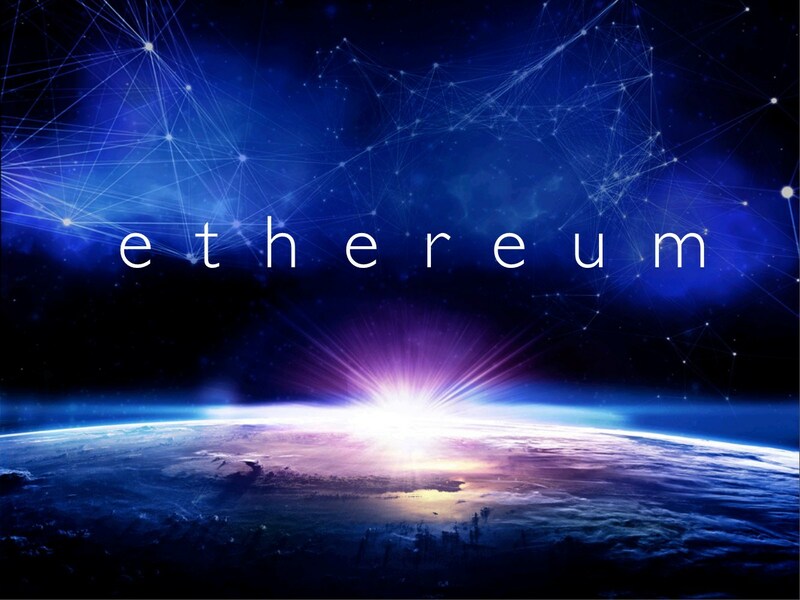 Ether, the world’s first and only cryptofuel, serves as a critical component that powers all computational steps and storage operations on the system. Without this mechanism, Ethereum would be subject to denial of service attacks, spam and would quickly grind to a halt as malicious or errant developers triggered infinite computational loops and other bad things. It was not an easy thing to explain but luckily for us there are open minds out there. After 42 days the Genesis Sale ended, and after pinching each other to see if we were dreaming, we realized that we’d touched a historical milestone. It’s still hard to believe, but we pulled off the biggest crowdfunding-like “one-time” initiative in the history of the Internet. Ever. 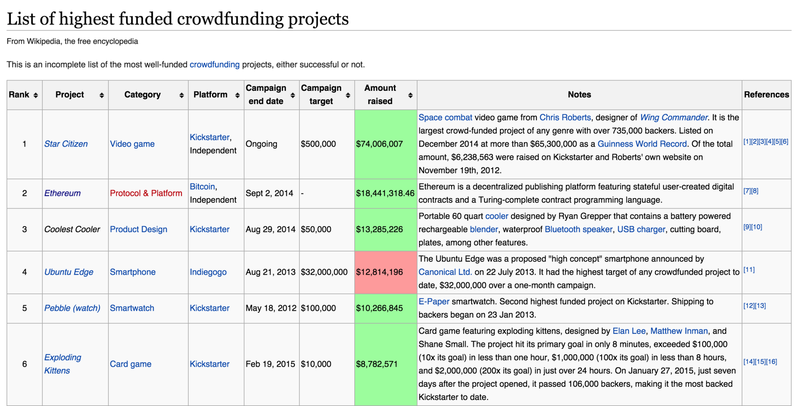 According to Wikipedia, Ethereum is rated as the second-biggest crowdfunded project in the history of the Internet – sitting proudly next to the first occupant that raised over $70 mil, but over the course of years, not 42 days. If you take a look at the list I think one of the most important things to observe is the nature of the project and the amount of support put into it. Sure, we’ve seen gadgets, consoles and video games raising millions in the past – but this time it’s about something serious and game-changing. More precisely, a Swiss-based non-profit, bootstrapped via crypto creating an open source, blockchain-based platform for building the next Internet and gifting it to the world. Right after this monumental achievement, things got even bigger. 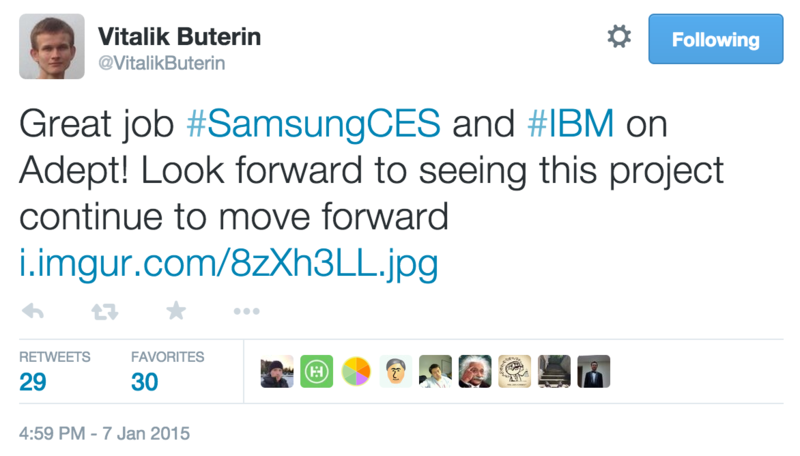 Paul Brody (IBM) was tweeting openly about IBM forking Ethereum and playing with it for their vision of the Internet of Things. It was certainly an exciting announcement and made some people look at Ethereum with different eyes . 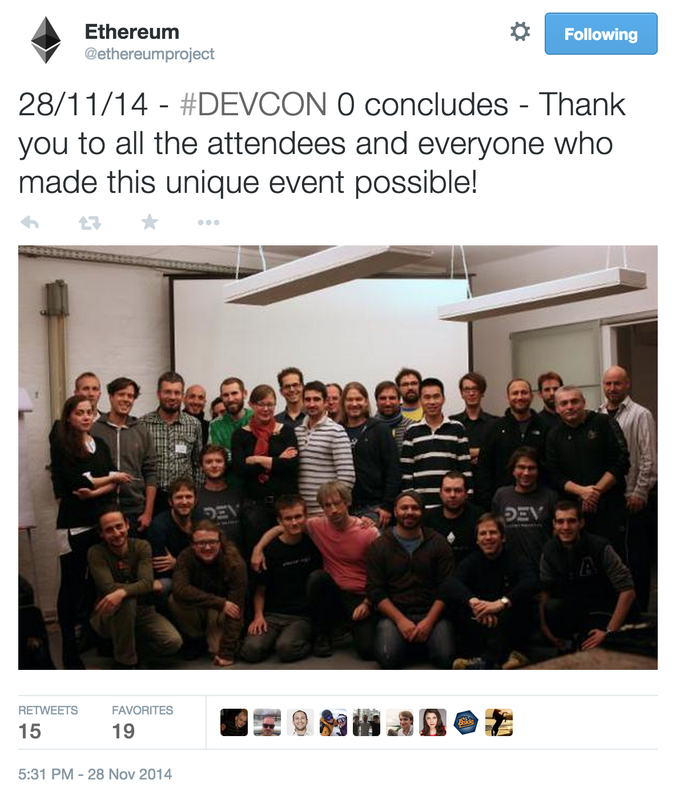 Moving forward, the autumn of 2014 was a dev team tour de force, both in terms of coding and in operations. By October the Berlin hub was operational and hacking hard, with the operations ramping up at an incredible rate, with October 5th marking the release of our PoC 6. It was a big release for a number of reasons, one of the highlights being the blockchain speed. The block time was decreased from 60 seconds to 12 seconds, using a new GHOST-based protocol that expanded upon our previous efforts at reducing the block time to 60 seconds. 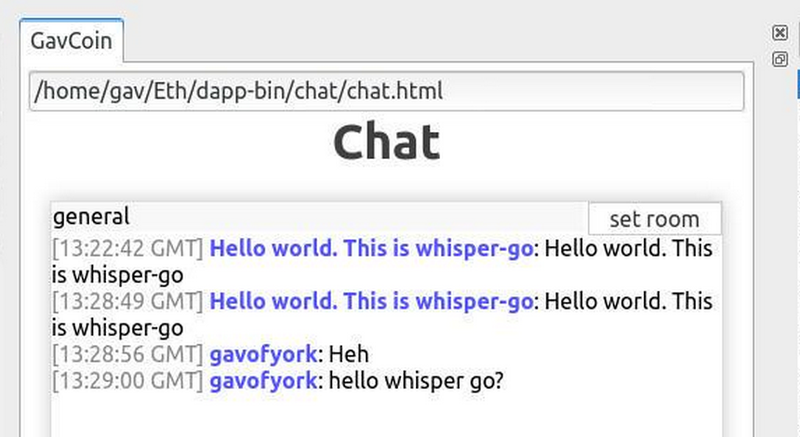 But that was not all: before the month ended, on the 26th we touched another milestone – the first whisper-based DAPP was live. 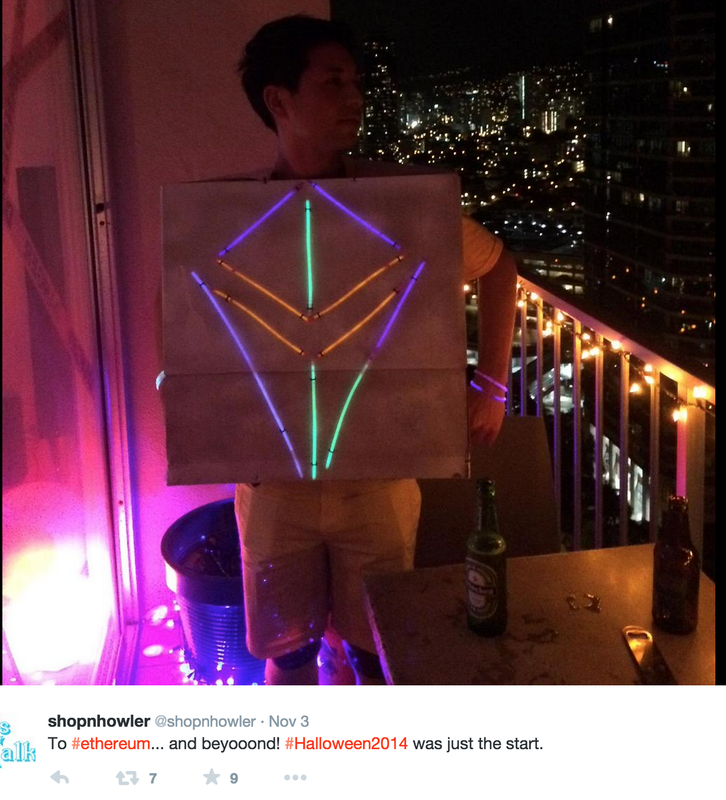 On November 3rd we hit another “world’s first” milestone – the world’s first Ethereum Halloween costume, created by a community member :) Meanwhile, by November 7th the Amsterdam hub was also operational and ready to “go go go”. The month of November peaked with Vitalik edging out Mark Zuckerberg to receive the World Technology Awards prize for the most innovative software in 2014 and continuing with the first Ethereum developer conference DEVCON 0 and a parallel hackathon on transparency organized in the Canton of Geneva. 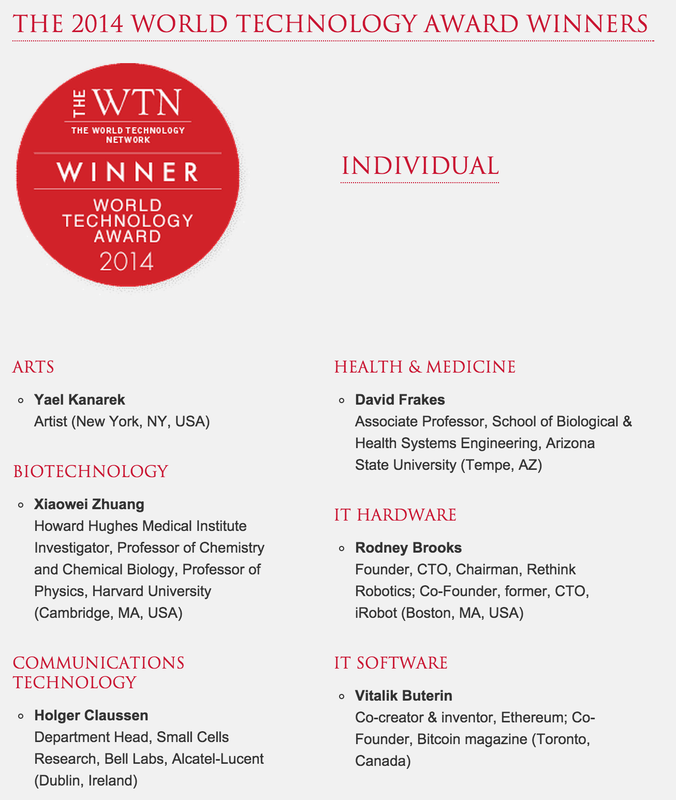 In the finals of the World Technology event, Vitalik faced four other nominees: Jack/Laura Dangermond, Christian Lanng, Kira Radinsky and (drums in the background) Mark Zuckerberg. However, Ethereum is innovation on a whole different level and apparently we are not the only ones thinking so. In a way, this event felt similar to the Thiel Fellowship: It was yet another official acknowledgement regarding the innovative potential this technology has. Aside from this, I think it’s also proof that there are many entrepreneurs and innovators out there keeping a close eye on #ethereum. 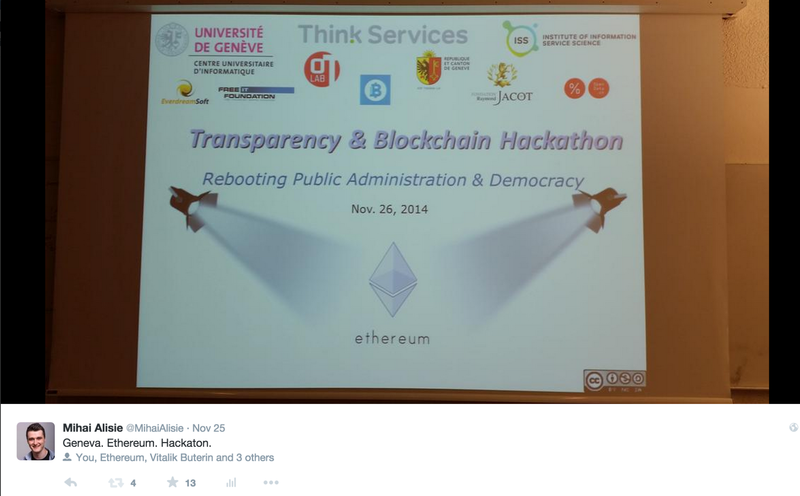 The hackathon on transparency was held on November 26th and was organized by Professor Jean Henry Morin and Stephan Tual at CUI Geneva, with the main topic being "rebooting public administration & democracy". 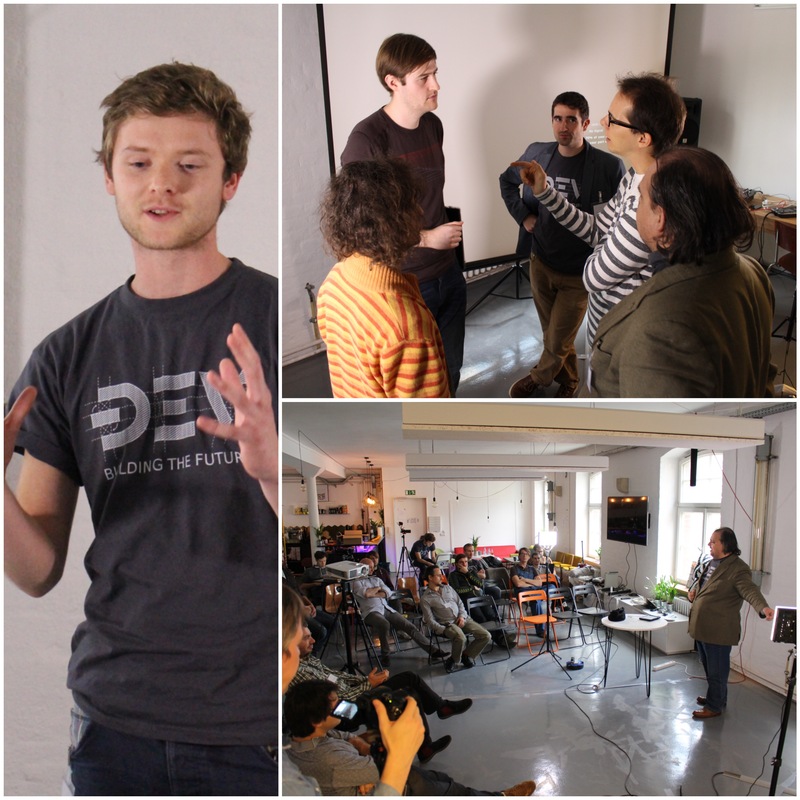 A diverse group of about 50 people attended the event and we split the presentation in two rooms – one for less-technical people and one for those that brought their laptops looking to build things on Ethereum. After the presentation I gave with Taylor ended, we mixed the participants and started the brainstorming session, with everyone thinking about cool ways in which blockchains can be used for transparency in public administration. All in all it was a great success, the night ending with Professor Morin attending a roundtable discussion with the Canton of Geneva on transparency and the advantages blockchain technologies like Ethereum bring on this front. Ethereum DEVCON was tremendously productive, and necessary, as it allowed us to have nearly all of the developers together and really get to know each other, disseminate a lot of information and chat over a lot of ideas. Five days of back-to-back presentations, coding and Ethereum discussions synced the distributed team members on the same wavelength. You can read a really nice recap of the conference here and watch the presentations given here. Before November ended, we also launched a community survey and the results were fantastic. It felt good to know that the community is with us, appreciating the work put into making this happen. After all, the project would be nothing without an awesome community to take things forward after the launch and we’re all aware of it. In the background, the security audits were about to get started, so the Ethereum stress-testing team was formed. Together with the security auditors, they help us reveal weaknesses inside the system for fixing. To date, no show-stopping flaws have been found and the audits are progressing nicely. 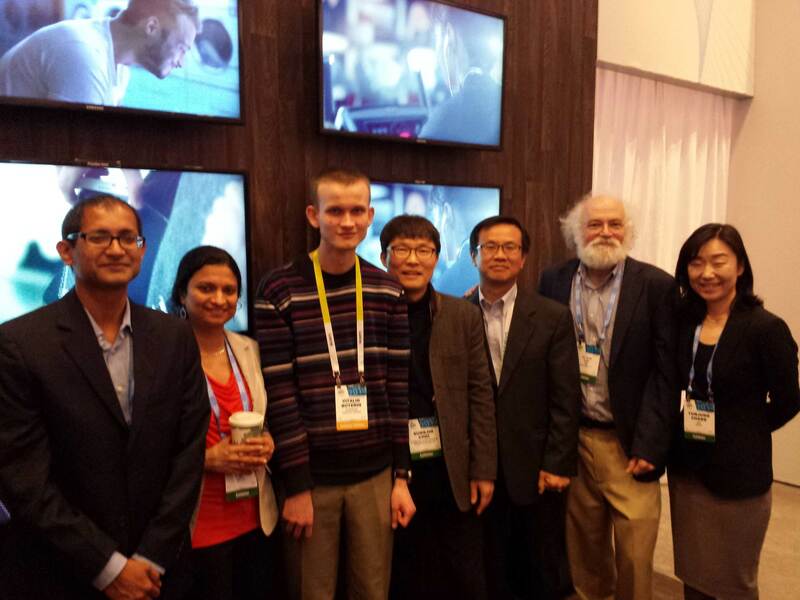 In January 2015 we launched the PoC 7 and V met with the guys from IBM and Samsung at CES where they were showing what they’ve built with Ethereum. It was both amazing and encouraging to see a few proof of concepts built in such a short time using Ethereum, even if at the time it was in a crude state. January also brought the launch of our bug bounty program, looking to encourage people from all around the world to poke at our code and expose the things that might have escaped our eyes and minds. In sum, January was a month of constant progress and optimizations with a few events spicing things up here and there. February brought the release of the PoC 8 release, the first Whisper group chat inside MIST (our Ethereum browser), and an increasing attention on the Genesis launch and the future plans at project level. 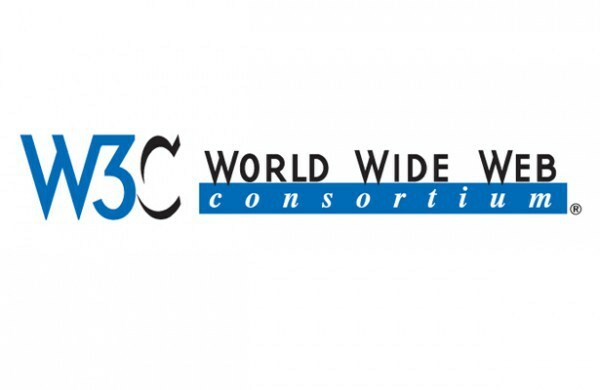 Ethereum was also recently asked to join the World Wide Web Consortium (W3C) and participate in the Web Payments Interest Group. The membership includes some of the largest banks, payments companies, tech companies and telecoms in the world. Ethereum had a strong presence at the most recent meeting of the group (Feb 2–4) in Utrecht and is likely to have significant input into crafting the designs proposed, use cases built and standards forged by this committee. The ultimate goal of the Web Payments Group is to deliver the payments component of the HTML6 spec. The road toward the ultimate release of that spec and incorporation by the browser manufacturers will be paved by the design, execution and refinement of many use cases, and Ethereum will both lead that development effort and serve as the leading candidate technology for much of it. 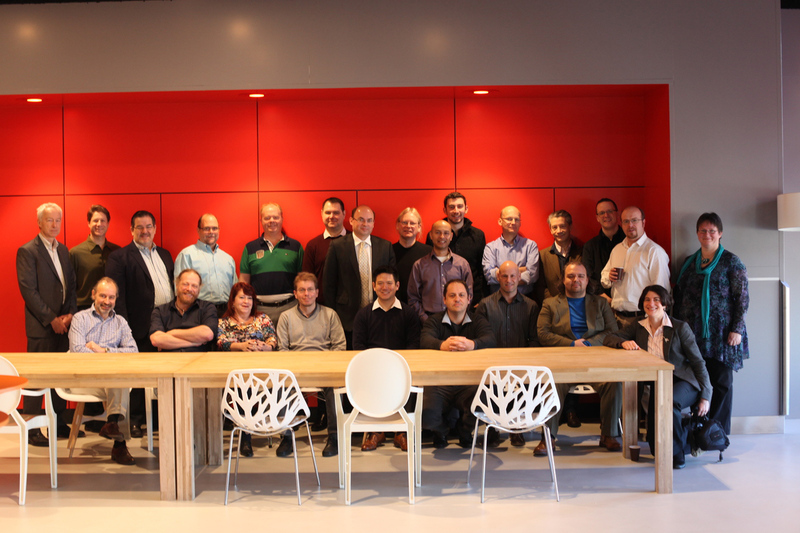 Below you can see the group picture taken at the last W3C organized in Utrecht, with Joseph Lubin and Vinay Gupta sitting on the right of the table. March started with a series of announcements regarding the Genesis Launch and intense work sessions of Proof of Concept 9. Vinay Gupta wrote a comprehensive article where he explained the codenames and what they mean for both users and developers, while Gavin has started documenting the development for the multi-phase Ethereum launch. All in all, it looks like an extremely busy and exciting period is coming for Ethereum. 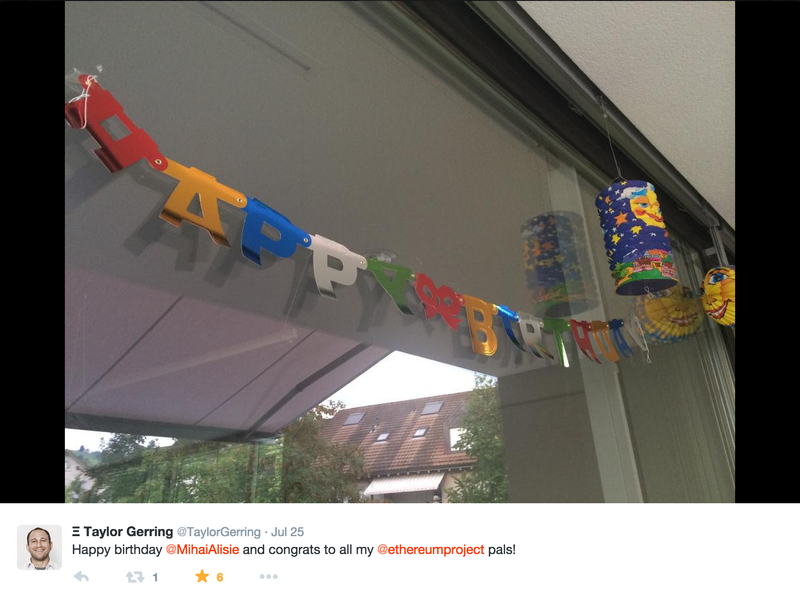 So…here we are, today, one year after we settled in our Swiss HQ – days away from launching the Ethereum network. 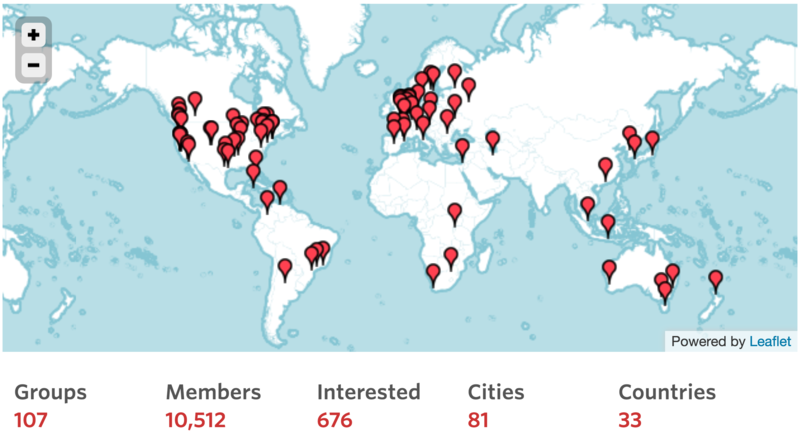 We’ve gone from a few guys trying to figure out how to bootstrap this project to a worldwide movement of thousands of people, over 100 meetups in 33 countries, hundreds of amazing volunteers and a world-class core team of over 40 members. 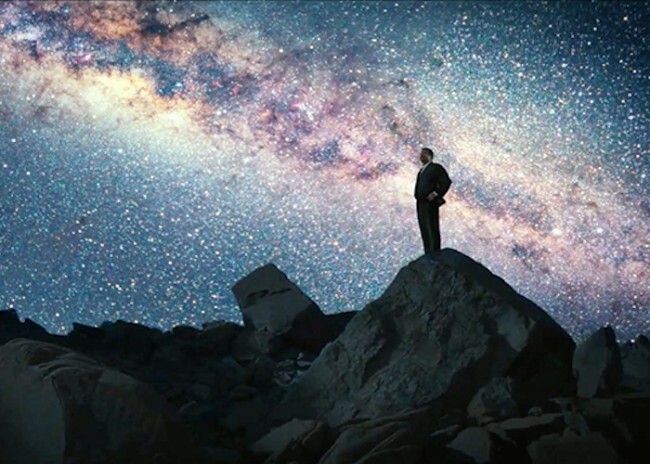 We’re now a planetary community of people learning, sharing and co-creating at light-speed. And things haven't even started yet.